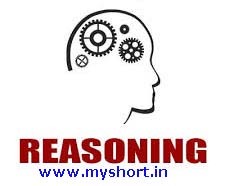 Reasoning Related Most Question With Answer Set 32 Current Affairs, Aptitude And Join the best Online Test Series & get all India Rank, Logical Reasoning. Logical Problems · Number Series · Verbal Reasoning and important Question & Answer with solution & Formulas in Hindi & English And Important Questions with Answers to Numerical Ability asked in Gramin Bank Office Assistant Exam And These all questions will very helpful to you for the forthcoming Bank exams, SSC CPO SI Delhi Police and Rajasthan Police and All Competitive Examination. Directions (1-3): In each of the questions given below, six statements are given, which are followed by three groups of statements made on systematic basis. Select the option in which the third statement indicates the first two statements, that option will be your answer. नीचे दिए गए प्रत्येक प्रश्न में छ कथन दिए गए है जिनका अनुसरण व्यवस्थित आधार पर गठित किये गए कथनों के तीन समूह द्वारा किया जाता है. उस विकल्प का चयन कीजिये जिसमे तीसरा कथन तर्कपूर्ण रूप से पहले दो कथनों को इंगित करता है, वह विकल्प ही आपका उत्तर होगा. iii. कोई X, R नहीं है. iii. सभी A, B है. Directions (4-5): In each of the questions given below, a set of six statements is given, which are followed by the choice of five answers. Each of the statements given in the answer option is given a combination of three statements. Select the answer option that is reasonably related. नीचे दिए गए प्रत्येक प्रश्न में, छ: कथनों का सेट दिया गया है, जिनका अनुसरण पांच उत्तर के विकल्प द्वारा किया जाता है. प्रत्येक उत्तर विकल्प में दिए गए कथनों में से तीन कथनो के संयोजन दिए है. उस उत्तर विकल्प का चयन कीजिये जो तर्कपूर्ण रूप से सम्बंधित हो. III. कोई फ्लाई बुक नहीं है. (e) इनमे से कोई नहीं.